Polysafe's steel framed concrete panels are heavy duty panels that give excellent performance in terms of strength, durability and grip. Introduced in 1991, the Polysafe panel built on the design of the original Bomac panel and added some design improvements. Level crossings using this system have been installed throughout the UK since the mid 1970s and continue to be a firm favourite today. 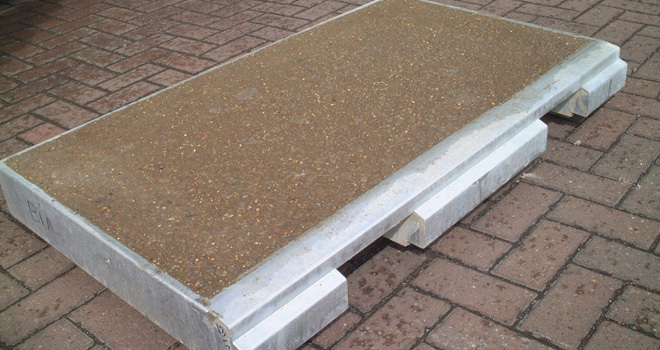 Their versatility means they are ideal for rail crossings of all types, and they are commonly seen on all types of roads - main roads, B roads or country lanes. They are also used as farm crossings, RRV access points and pedestrian routes. Their durability is key and concrete Bomac panels that are 20 years old are still in service today, making them highly cost effective. 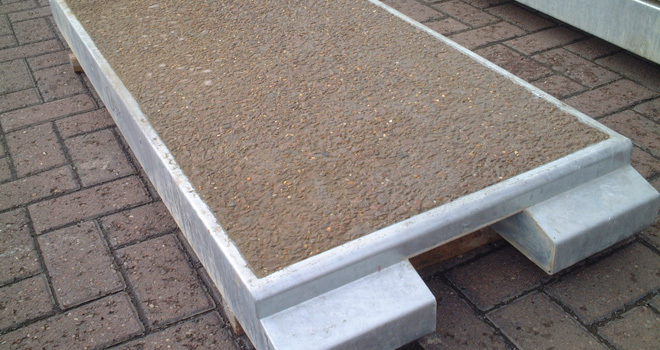 Polysafe concrete panels are completely compatible with old Bomac panels, and can be mixed with these for maintenance. Although seen as stronger as a complete level crossing deck, they can also be mixed with rubber level crossings (e.g. can be installed in the cess where there are rubber level crossing panels in the 4 foot). Easy to install, the design also offers excellent drainage, minimal impact on the rail infrastructure itself and minimal maintenance.